So, I got this lovely floral skirt from Target about a month ago and thought it was about time I finally get some wear out of it. As you know, if you’ve read my posts before, skirts stress me out. I never know what top to pair with them and short people like myself can look frumpy very easily in an ill-fitting skirt. I decided to throw caution to the wind and give it a go anyway. This skirt intrigued me because it combines a few trends that are big right now. 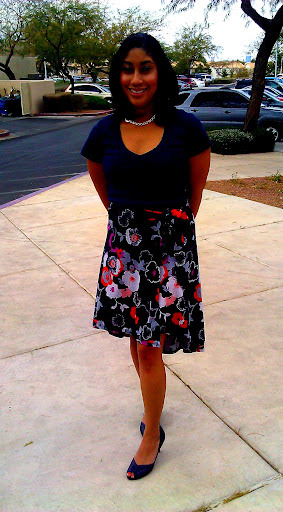 Of course floral prints are always big in the spring and you may not see it in the pictures but this is a wrap skirt. The best feature of this skirt is the high-low hem, sometimes called a shark bite, or asymmetrical hem. It depends on how much the length varies but the hem starts out shorter in the front and gets longer as it goes back. High-low hems are popping up on maxi dress, tops, skirts, and even jackets. If you haven’t seen this trend yet, you will very soon notice it everywhere. Since I didn’t know what to pair it with, I kept it simple. I paired a simple v-neck tee in the same color scheme which I think worked out pretty well because a lot of people thought I had on a dress. 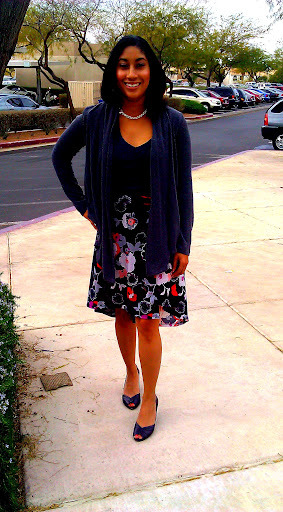 Since it was cold, I put on a grey cardigan and purple heels because apparently a loud floral skirt isn’t a big enough pop of color for me. Skirts make me realize just how short my torso is but hey, we gotta work with what we have. what do you think?